"Your estimated benefits are based on current law. Congress has made changes to the law in the past and can do so at any time. The law governing benefit amounts may change because, by 2034, the payroll taxes collected will be enough to pay only about 79 percent of scheduled benefits." – from the June 2018 Social Security Statement. A personalized Social Security statement including the up to date benefit reduction amount is mailed to everyone periodically starting @ age 25 & is also available online. 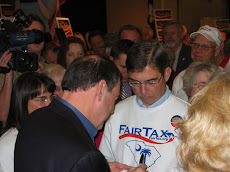 I have never met one person @ my FairTax seminars or anyone who has participated in radio programs I have been on that was aware of this benefit reduction warning – even though it has always been prominently displayed on page 1 or 2 of the aforementioned Social Security statement. The trustees annual report of Social Security & Medicare issued in June reported that for the first time since 1982 the Medicare hospital-insurance trust fund (HI) & both the Social Security trust funds for retirement (OASI) & disability (DI) will be forced to dip into their reserves this year. 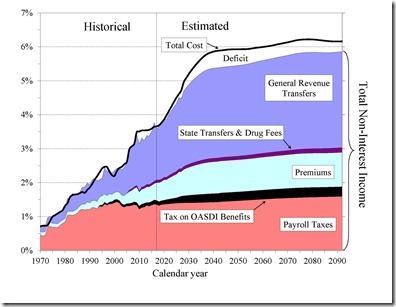 These trust funds are projected to continue diminishing until they are depleted – the Medicare hospital-insurance trust fund in 2026, the Social Security retirement trust fund in 2034, & the Disability trust fund in 2032. See graphic below. The depletion of the Medicare hospital-insurance trust fund is now projected to be three years sooner than was projected in last year's trustees report – so in the case of Medicare in one year's time we lost three years. In the case of the Social Security retirement trust fund there was only a loss of a few months in the projected life of the trust fund since the last annual report. Not good but much better than for Medicare. With regard to starting to draw on the respective trust funds in 2018 Social Security moved up four years sooner than calculated in the last annual report & Medicare moved up five years sooner. We can question the caliber of the calculations but the important point is that trust fund interest income plus both Social Security & Medicare payroll taxes are not enough to cover benefits starting this year. As regular readers of RTE know the trust funds of both Social Security & Medicare are accounting gimmicks in that the money has been received from payroll taxes in the surplus years but Congress could not resist spending the surplus & putting IOUs in the trust funds' non-existent lock boxes. 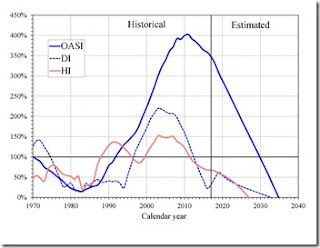 There are no real economic assets in the trust funds whose bookkeeping balances will be recalculated as money is theoretically drawn down until it reaches zero – the point that the above mentioned 21% reduction in Social Security retirement benefits will occur for all participants regardless of age. Medicare hospital benefit reduction is estimated to be 9% upon exhaustion of the Medicare hospital-insurance trust fund. From the mid-1980s through 2009, Social Security took in more in tax revenue than it paid out in benefits, which allowed it to build up its trust-fund reserves. In 2010 Social Security's expenditures began to exceed its tax income, so it began to rely on its trust funds' interest earnings, paid from the government's general fund. 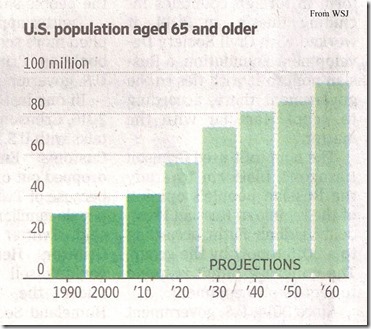 Source – Charles Blahous, former public trustee for Social Security & Medicare programs. See graphic below that shows the way Medicare is financed – cost measured as percent of GDP on the graphic. Note the increasing slopes of the curves for premiums for people on Medicare, general revenue transfers from taxpayers of all ages – young & old alike, & of course the total cost curve. The Medicare deficit widens as shown on the top of the graphic – there is no provision under current law to finance that shortfall through general revenue transfers or any other revenue source. Now all of us who are breathing know that the demographics for the sustainability of Social Security & Medicare is terrible. There are 10,000 baby boomers reaching the age of 65 every day between now & 2029 & the number of workers who support one Social Security retiree has dropped from 41.9 in 1945 to less than 2.9 today with projections of 1.5 in the out years. See graphics below. When I was in my 30s & 40s people just starting out in the business world in their 20s were fond of saying they believed more in flying saucers than they did in receiving any Social Security benefits. 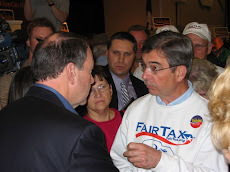 Since they were new to the business world they had not paid a lot of payroll taxes so they thought they could afford to be cavalier about it & even possibly thought something would be done to improve Social Security's outlook. But here we are today & these people have now paid payroll taxes all of their business lives & are ready to retire dependent on the Social Security & Medicare programs described above. So with such an obvious problem that has been obvious for decades, why have our elected representatives not forged ahead to solve it? Lawmakers have a broad list of policy options that could close or reduce the long-term financing shortfalls of both Social Security & Medicare – I have suggested the best ones repeatedly on this blog. The sooner the problem is addressed & remedied the better – who can disagree with that? The sooner a proper fix is implemented the more time will be available to phase in changes to give the public time to adjust & prepare. Well, to answer the subject question, most politicians who advocate against poverty have no personal stake in eliminating poverty's cause or foresee themselves having Social Security & Medicare being the economic foundation of their existence. In fact, statists - Democrats & RINOs - have a vested interest in keeping people in poverty or heading that way dependent on programs like Social Security & Medicare whose financial condition is only projected to deteriorate – their deceitful rhetoric gives false hope to those who have not yet realized man's natural God given condition is one of freedom, self sufficiency, & prosperity. The statists' aim is to make as many people as possible dependent on government – both financially through taxes & physically through universal healthcare. Since elected representatives have no skin in the game because they have resources that make them not have to rely on Social Security or Medicare solely, why would they ever put their vote on the line and alienate a group of their constituents who disagree with their vote? I wish Americans would understand how our forefathers fought and sacrificed for liberty so they would fight for their own economic liberty now instead of relying on schemes that take from someone else. They don’t cause it is a cash cow for them to spend and buy votes with. Plus they don’t have to depend on it, so they don’t care. Your last sentence of the first paragraph is spot on. But Social Security & Medicare are no longer the cash cows that provide money to spend on anything & everything as highlighted in the post – in fact these entitlements are under pressure as the funding from the general treasury winds down in the not too distant future when we have the 21% & 9% cuts in benefits. They are still used to buy votes by promising not to cut them despite the deteriorating nature of the programs. It is important to understand this dynamic. Conclusion of statist aim to increase dependency on Gov is extremely telling: statist morals not only include keeping low income and not ambitious for their votes, but also no remorse that they risk a severe financial crisis far exceeding 2008. But they may have overplayed their hand. Trump Black approval rate is up to 29% from 15% in 1 1/2 years. No wonder the Left is apoplectic against Conservatives like Candace Owens with harassment at a coffee shop. Kudos to courageous Candace who calls out the Left lies and will debate anyone in a civil way. Doug - Do you know what is the actual amount in Social Security's reserves as of 2018 are? Not the iou's but the actual monies? The answer to your question is "nothing" whether you call them trust fund balances, reserves, or holdings. 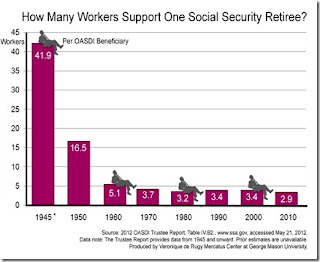 “There is no cash in the Social Security trust fund, and there never has been any. “The Treasury both receives the payroll taxes (and income taxes that higher-income retirees pay on their Social Security benefits) and pays monthly benefits on behalf of the Social Security Administration (SSA). The money stays in the Treasury's hands until it is either paid out as Social Security benefits or otherwise spent by the government. In fact, no money ever goes into the trust fund. Instead, the trust fund balance is the result of two accounting entries by the Treasury. “First, the Treasury estimates how much of the aggregate tax receipts are Social Security taxes and "credits" the Social Security trust fund with that amount. Then the Treasury "subtracts" the total amount paid in monthly Social Security benefits from the trust fund balance. No money actually changes hands; these are strictly accounting entries. Any "money" remaining in the trust fund is converted into special-issue Treasury bonds (see above from Trustee report), which are really nothing more than IOUs. In addition, the Treasury pays interest on the trust fund's balance by crediting the trust fund with additional IOUs. These are also strictly accounting entries, and again no money changes hands. After crediting the trust fund with the proper amount in IOUs, the government spends the extra Social Security tax collections just like any other tax revenue--to finance anything from aircraft carriers to education research. “In short, the Social Security trust fund is really only an accounting mechanism. The trust fund shows how much the government has borrowed from Social Security, but it does not provide any way to finance future benefits. The money to repay the IOUs will have to come from taxes that are being used today to pay for other government programs. For that reason, the most important date for Social Security is 2018, when taxpayers must begin to repay the IOUs, not 2042, when the trust fund is exhausted. The episodes we have had over the years with raising the debt ceiling prove there is no separate SS fund with assets that can pay SS recipients; i.e., Congress needed to borrow money to make the SS payments. That was what I thought, there are no cash reserves. They simply don't give a straight answer. I also believe one of the reasons they push illegal immigration to become legal is then there would be a big boost to social security and tax collection. Simply another way to obfuscate the fact that they are broke and do to want the average taxpayer to tar and feather them. My research has shown that SS has been running negative since 2010. They simply lop all the monies collected together in a "general account". The government has been running deficits every year since the 1970's. They used to "borrow" (i.e.raid) from SS and "the SS lock-box" (even though the tobacco farmer turned politician, Al Gore stated they don't). Now that SS is also running negative they just turned on the printing presses and inflated the currency. Sure seems like a government version of a Ponzi Scheme to me! !